I got out today for a nice little trail ride over a long lunch break. I left Grover Center, rode the bike path to the Community Center, and then took Avon up to Sells Park. 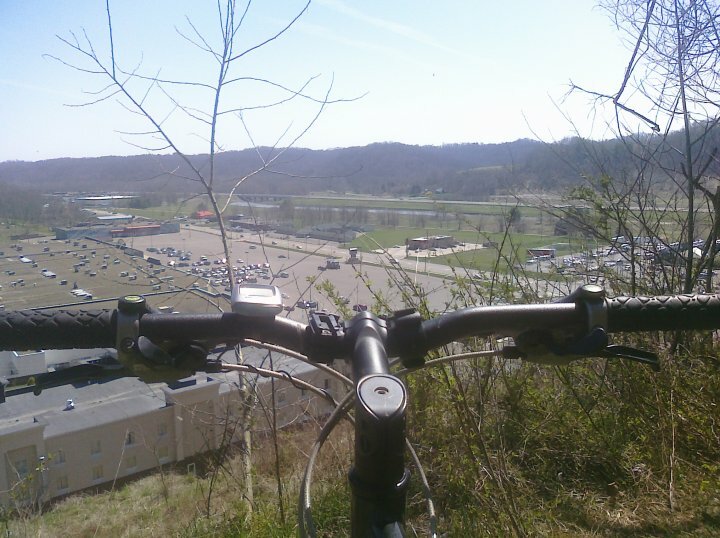 Once at Sells, I rode up to the top of the ridge (pushed it mostly) and took the Athens Trail until it connected with the Rockhouse Trail. 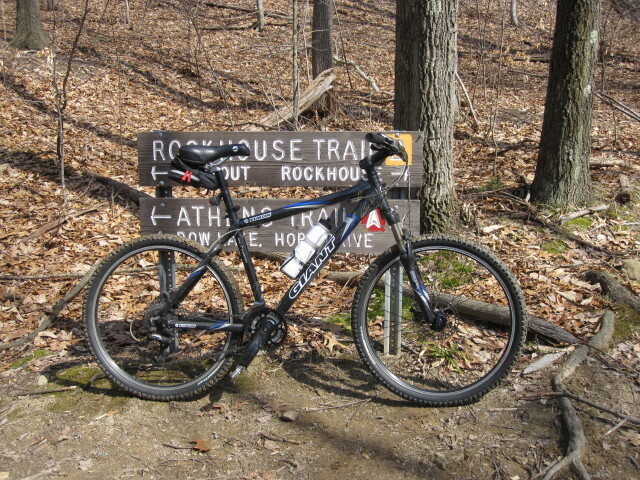 I took the Rockhouse back to Sells Park, then back to campus. Total ride time was about 70 minutes, including stopping for breathers and the red light to cross East State Street. I was actually pretty impressed by how well I did on the trail today, considering this was only the second time out this year. I was able to make it up some of the hills and clear some of the more technical sections that I couldn’t do last year. This gives me a good deal of confidence going into the cycling season. It was a fantastic day to be out on the trails. Rockhouse was soft in a few spots, but it won’t ever be fully dry until the middle of the summer. I bit the dust once real good, likely caused by my front wheel sliding out in a muddier gully section. Fortunately nothing was hurt but my pride, but only the trees saw me bust. I also broke a spoke when I first started on the trail, but I continued to ride. The wheel held up fine, and I may try to ride it a bit more before getting it repaired. It was awesome to get out, and I’m already jonesing for my next time on the trails. Now, just to find some more time to ride. Today was my first trail ride of the season. I started at Grover Center and rode through campus to the Bike Path. I then took the Bike Path to Sells Park (about 2.8 miles). I decided to take the Rockhouse Trail to the Athens Trail, down to East State Street, back to the Bike Path, and back to Campus. There were several places that I had to get off and walk on the Rockhouse Trail. I’m needing to ride a lot more to get my lungs in a bit better shape. While I’ve been doing interval training at the gym, I still got really, really winded on a few of the hills. Also, with the spring rains, a few places on Rockhouse were quite boggy. Next time I may just stick to the Athens Trail, unless we’ve had dry, sunny weather for a good solid week or more. I also got a nice flat on the ridge just past the Rockhouse/Athens Trail intersection. I must have landed a nice thorn, as air was spewing out of my tire. I also apparently broke a spoke. Thanks to my Eagle Scout tendencies, I had a spare tube and a pump, so I fixed the tube in about ten minutes. I’ve had quite a bit of practice changing flats in the last few months, so I’ve got the routine down. The entire ride was about 12 miles round trip, with about seven miles on pavement. I thought I would try the route to see if I could get over the the trails on my lunch break and back in an hour. With the flat and my walking, it turned out to be two hours. I guess that gives me something to work for. Next time I’ll try the Athens Trail and loop back to Sells Park via one of the bailout trails. That would make the ride shorter, but perhaps make it easier to get back under 60 minutes.